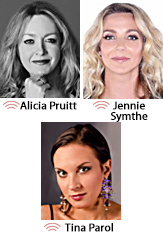 Warner/Chappell SVP/A&R Alicia Pruitt, Girlilla Marketing CEO Jennie Smythe and Disney Music Publishing singer/songwriter Tina Parol have joined Music Health Alliance's Board of Directors. The 18-member board works to develop strategic plans for the non-profit, which supports members of the music community with medical and financial solutions. See the full board here.